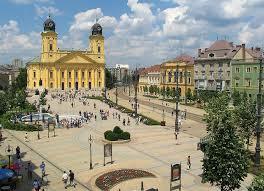 Debrecen is the second largest and populated city in Hungary. At times this city is known as the “Calvinist Rome” or the “civisvaros”. This city is also the cultural, economical and tourist center of Hungary. 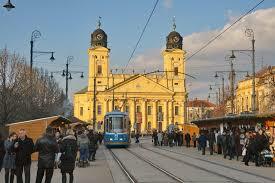 The University of Debrecen has around 25,000 students so the city is usually filled with lively and active students. When visiting Debrechen you cannot miss seeing one of the city’s grandest landmarks the Great Church. This church counts as Debrecens most recognizable building and is a symbol of this city. The church was once looked upon as the center piece of “Calvinist Rome”. Visitors can take a look at its impressive interior and go up to the tower for fantastic views and to get a look at the Rakoczi bell. This bell is the largest bell in Hungary. Of interest is St. Anne’s Cathedral built between 1721 and 1746. In the niches that are found next to the doors on the left visitors can see the statue of Saint Stephen and on the right side is the statue of his son Prince Saint Emeric (Imre). Inside the main altar piece represents Saint Anne, who was the patron saint of the church, teaching Maria. The oldest altar piece is a representation of Saint Joseph Calasanzi, the founder of the Piarist order. The carvings and statues of the by-altars date back to the 18th century. On the ceiling and underneath the windows you can see frescos and stucco ornaments that represent the saints of the Arpad dynasty. In front of the University Reformed Church you’ll find the “White Rose of the Revolution” memorial. This marble memorial was created by Miklos Melocco, who is a member of the Hungarian Academy of Arts. It commemorates the revolution and the heroes of 1956. On Piac Street at number 57 you’ll find Kaszanyitzky House where the famous glass-man Endre Kaszanyitzky once had his shop dating from 1852. This house was built at the beginning of the 19th century with neoclassic sculptures on its staircase. Having been rebuilt several times you can see signs of Baroque, Classicism and even Eclecticism. A most lovely sight is the Flower Clock. This is the first sundial of Debrecen and was unveiled on Baltazar Dezso Square on July 10, 2009 – 40 days before the 40th Debrecen Flower Carnival. This flower clock is a sundial with a carved prismatic limestone column. Its clock-hand is a long metal rod with metal arches under it which refer to the astral orbits. The end of the hand is decorated with the wing of the Phoenix – the symbol of the city. In all the shape of this Flower Clock is like a sweep-pole well evoking the world of the “puszta” (a grassland biome on the Great Hungarian Plain around the River Tisza in the eastern part of Hungary). At one time where the Flower Clock now stands was a house in which Ferenc Kolcsey lived. Kolcsey was the poet who wrote the original poem that became the Hungarian National Anthem. Therefore this column and sundial not only represents the flower carnival but also the poet. 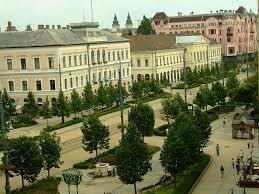 Kossuth Square is Debrecen’s main square and was opened on July 1, 2001. Since then this square has become a community space. Interesting events take place here such as the Turkey Days, a gastronomical event in the summer, the Civis Promenade organized over weekends in July, the Flower Carnival the best-known festival in the city and the Bela Bartok Choir Competition known internationally. The city Christmas Tree is set up here during the holidays and people welcome in the New Year with concerts and street parties. This square was named after Lajos Kossuth who was one of the “greatest” Hungarians and one of the most outstanding figures in the 19th century fight for national independence, for the abolition of feudal privileges and for the granting of civil rights and also the intellectual leader of the Hungarian War of Independence. He became the Finance Minister, afterwards President of the National Defense Committee and later on elected to the Governor-President of Hungary. You can see the natural flora of Hungary in the Arboretum at the Debrecen University Botanical Garden. Here you can stroll among alleys and green spaces in an area of 8 hectares. You’ll find yourself in the primeval Nagyerdo Oak Forest and can delight in the Greenhouse Harbors with the biggest collection of succulent plants throughout Central Eastern Europe. For great art visit the Deri Museum located behind the Great Church which has one of the richest cultural historical collections in Hungary. The building is designed in the neo-baroque style. In front of the museum visitors can see the four world-famous statues of Ferenc Medgyvessy which were granted the Grand Prize of the World Exhibition in Paris in 1937. Among the permanent exhibitions are the history of Drebecen from the 13th century until the Reform Era, the art of Mihaly Munkacsy, the Deri-collections, Birds of Our Regions and the World of Minerals. The most famous work is by Hungarian Mihaly Munkacsy – Christ Trilogy, three large paintings that show Christ before Pilate, the Crucifixion and Ecce Homo. Vidampark a small but impressive amusement park which has 15 rides including a fantasy castle, a Ferris Wheel and a children’s railroad. Aquaticum the major resort of the town featuring a water park, public pool, bath house, hotel and restaurants. DVSC Stadium where local soccer teams play. Kossuth Lajos University found just west of the park and is one of the largest universities in the region.